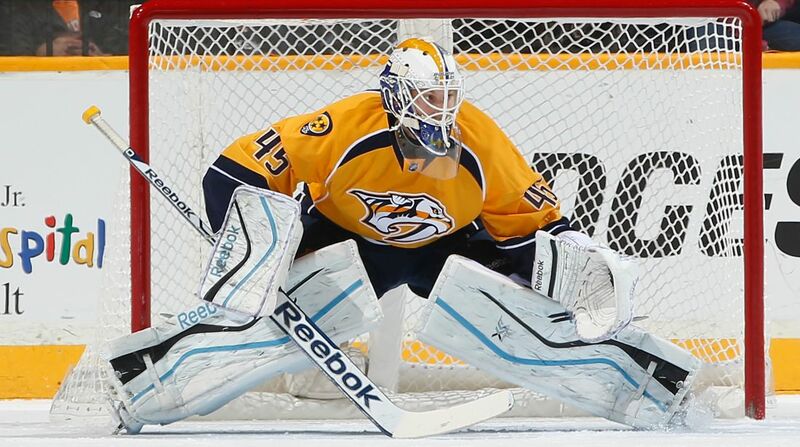 The Rangers have agreed to terms with Magnus Hellberg on a two year deal. Photo courtesy of John Russell/Getty Images. Jeff Gorton, the General Manager of the New York Rangers, announced that the team has signed restricted free agent goaltender Magnus Hellberg, who was acquired in a trade from the Nashville Predators. NBC Pro Hockey Talk’s Mike Halford reported that it was a two year deal. Hellberg, 24, spent most of his time with the Milwaukee Admirals of the American Hockey League, the Predators’ AHL affiliate. He appeared in 38 games, finishing with a 15-10-6 record along with a 2.33 GAA and a .913 save percentage, as well as three shutouts. At 6’6” and 200 pounds, Hellberg has one thing that you can’t teach; size. In today’s NHL, large goalies are become the new norm. Ben Bishop, Pekka Rinne, Mike Smith, Scott Darling and Robin Lehner are all tall goalies, and teams are leaning towards guys who take up more of the net, and can cover the top parts of the net with ease. A former second round pick out of Sweden in 2011, Hellberg has shown promise, and will help the Rangers fill out the roster for the Hartford Wolf Pack. He’s in line to be the number three goalie on the depth chart, in front of Cedric Desjardins. Desjardins struggled after tearing his ACL, and didn’t look the same. Mackenzie Skapski is recovering from hip surgery that will keep him sidelined until November. This was a great trade by Gorton, mainly because it only cost them a sixth round pick. If Benoit Allaire can mold Hellberg in his image, the Rangers could have another quality Swede in net for them, with size to boot. Posted on July 10, 2015, in Rangers Updates and tagged Antti Raanta, Cam Talbot, Cedric Desjardins, Hartford Wolf Pack, Hellboy goalie, Henrik Lundqvist, Mackenzie Skapski, Magnus Hellberg, Nashville Predators, New York Rangers, New York Rangers blog, NHL Trades, NYR, Rangers, Rangers blog, Rangers goalie, Rangers RFA, Wolf Pack. Bookmark the permalink. 7 Comments. Raanta will be a UFA next year (commanding more money), and things’ll be tight again with the signings we’ll have to make (Hayes, Kreids, etc…). Hellberg will be our backup next year (nearly guaranteed, IMO). Hope the contract is around 600k to 750k AAV NHL salary. Yeah I’m assuming his NHL value would be around that, or even cheaper. Could be like Darling’s (550k). My guess is that he will be a starter with the Pack, and at the age of 25, if he performs well, he certainly could be the backup for the 2016-17 season. Skapski is only 20 so he needs development time. Ended up a little higher than I had hoped. It is what it is and is still not a lot of money. Two-Way, Two-Year contract @ $884,625 NHL and $73,500 AHL. Same dollar amount for each of the next two seasons.